Talk about a productive weekend! Some of us run some errands, work on the yard, maybe hit a soccer game or two. Well the people of Halifax have officially raised the bar on weekend production. The people of Halifax built a playground. Hundreds gathered as part of a community build to resurrect the Halifax Open Play Space. The original wooden structure – built in 1991 – was taken down six years ago after falling into disrepair and becoming a safety concern. After the demolition the “Friends of HOPS” went to work. The group of about 10 volunteers held countless fundraisers, from the annual “Hop for HOPS” 5K, to the cow bingo “Plop for HOPS” to ”Chops for HOPS” meat raffles and “Rock for HOPS” concerts. They also helped secure a $50,000 grant from the state. When all was said and done they gave the town more than $200,000 towards a new playground. The new space is completely ADA compliant and features many cutting edge pieces including several spinning structures, a climbing structure and a 75-foot zipline. It currently remains closed until the playground’s rubber pathway can be poured in place but should be ready in the coming weeks. Plympton’s Winnetuxet River and Taylor Pond were stocked with about 600 brown trout on Monday. This photo by Michelle Smith caught the fishery guys in the act. 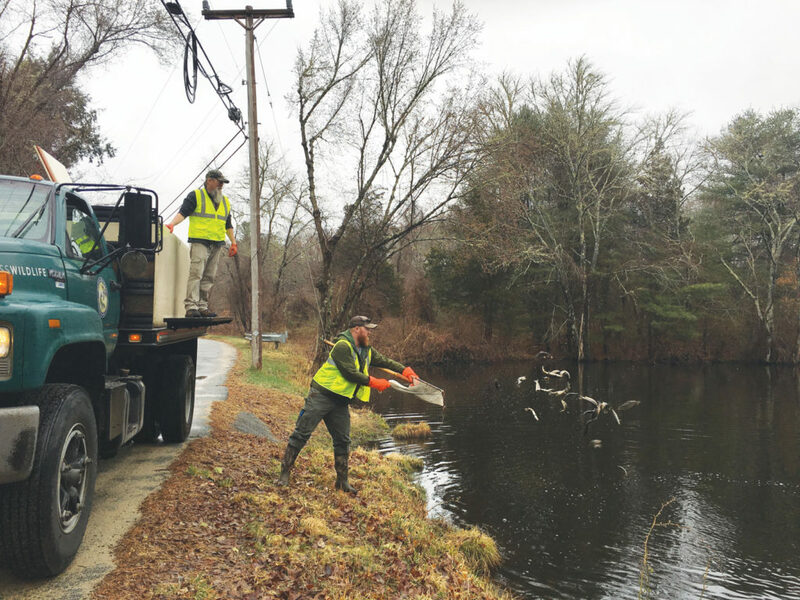 Many rivers and ponds are in the process of being stocked with trout by the Massachusetts Division of Fisheries and Wildlife, as they get ready for the spring fishing season. Biologists at Fisheries and Wildlife told the Express that about 600 Brown Trout were released into Taylor Pond on Monday. Taylor Pond is considered a “put and take” stocking site, and the trout are not expected to winter over and naturalize, according to Fisheries biologists say. They don’t stock Monponsett Ponds because that water is too warm, according to the biologist. Trout are cold water fish and a water temperature of 52 degrees is ideal. About 3,000 trout, a mix of Brook Trout, Brown Trout, and Rainbow Trout were released into the Indian Head River, which runs between Hanover and Hanson. These trout, measuring between 6 inches and 8 inches, were raised in the Sandwich hatchery, and were part of close to a half million fish stocked throughout Massachusetts this spring. Coupled with the more than 65,000 fish stocked last fall, the 2019 fishing season should be excellent, according to the fisheries personnel. Halifax Town Clerk Barbara Gaynor has announced that the following have returned their nomination papers and will be listed on the ballot for the town’s annual election on May 18. The deadline to return nomination papers was Friday, March 29, at 5 p.m. in order to have the candidacy printed on the town’s election ballots. Two candidates will seek the single selectman’s position left by retiring Kim Roy. Gordon C. Andrews, a current member of both Halifax Elementary School Committee and the Silver Lake Regional School Committee will face off against Melinda Tarsi, a member of the Finance Committee, in the election’s only contested race. Board of Assessors – Thomas Millias; Board of Health – John Weber; Constable, two positions – Thomas Hammond and Thomas Schindler; Board of Library Trustees, two positions – Paul Delaney and Madeline Flood; Park Commissioner – Thomas Schindler; Silver Lake Regional School Committee – Paula Hatch; and Board of Water Commissioners – Donald Bosworth. Amy Troup will seek election to Planning Board for the 5-year term. She is unopposed in her race. There is no candidate for the Halifax Elementary School Committee three-year term. The Annual Town Election will be held Saturday, May 18, at the Halifax Elementary School gym. The polls will be open from 10 a.m. to 6 p.m.
Assistant Town Clerk Patricia Detterman, the Town of Plympton Annual Town election will take place Saturday, May 18, at the Plympton Town House, 5 Palmer Rd., Rte. 58, Plympton. Polls are open from 8 a.m. to 6 p.m. The last day to return nomination papers with at least 20 signatures was last Friday, March 29. Incumbent Arthur B. Morin, Jr., for the 3-year term on the Board of Health; incumbent Christine Winslow for the 3-year term on the Board of Library Trustees; Linda Lawson for the 2-year term on the Board of Library Trustees; incumbent Steven Lewis for the 3-year term on the Finance Committee; Barry DeCristofano for the 3-year term as Town Moderator; John Schmid for the 3-year term on the Planning Board; Ann Sobolewski for the 5-year term on the Planning Board; Amy Hempel for the 3-year term on the Plympton School Committee; Michael Antoine for the 2-year term on the Silver Lake Regional School Committee; Patricia Detterman for the 2-year term as Town Clerk; and incumbent John Traynor Jr. for the three year term as Selectman. There are one 3-year term for Board of Assessors, one 3-year term on Finance Committee, and one 3-year term on the Board of Library Trustees that have no candidate. 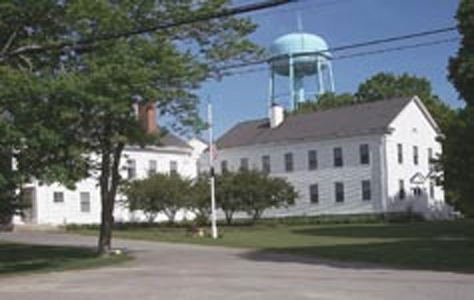 Voting will take place at the Plympton Town House, Saturday, May 18, from 8 a.m. to 6 p.m.
Plympton School Committee and Dennett school leadership discuss recent events at the elementary school. 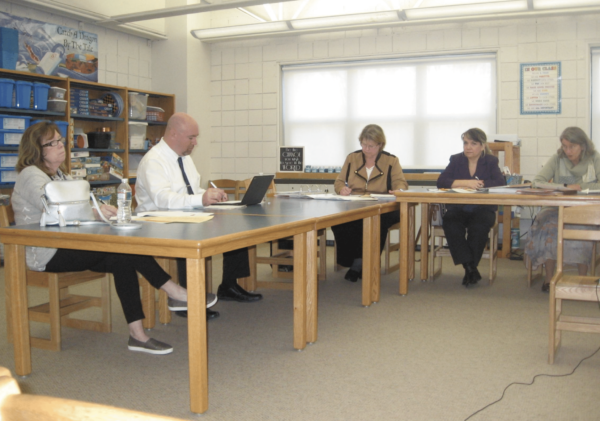 PLYMPTON – Results showing lead in the water at the Dennett Elementary school were discussed at the Monday, March 25 Dennett School Committee meeting. While some of the results were showing clean, others were showing traces of lead. The areas of the building where the lead results were found are sporadic and random and include portions of the school built after 2000 when lead would not have been found in pipes or other building supplies. Three different people from the Department of Environmental Protection (DEP) have been unable to identify a logical reason for the findings. The committee expressed frustration with the lack of a resolution as each set of test results seem to come back more inconclusive than the previous ones. While Green Seal has stated that they don’t believe their system is to blame for the results, the school committee agreed that the next logical step might be to get a representative from Green Seal to come out to the school. On a more positive note, the Dennett Elementary School playground project, which has been ongoing since 2015, was also discussed. Vice chair Jason Fraser spoke to the three main goals in the development of the project; that it be accessible to all students, that it be safe for all students, and that it be developmentally appropriate for all students. The total cost for the playground is roughly $228,000 of which some $132,000 has accumulated in the form of school choice funds available for a one-time need such as this one. Voters will be asked at the May 15 town meeting to approve the remaining funding through an article by the Community Preservation Committee. If approved, the article will provide $94,000 toward construction of the playground. Fraser stressed the importance of residents attending the May 15 town meeting in order to secure the necessary funding. Additionally, other individuals have approached the committee with offers to donate equipment, etc. to the playground if the money is passed at town meeting. Principal Peter Veneto spoke about the myriad of upcoming events at the Dennett school. In a testament to the school’s academics, up to 80% of the sixth grade is expected to attend this week’s Grade 6 honors breakfast. Friday, March 29, will be the students vs. teachers/parents basketball game. DARE graduation will be Tuesday, April 2. The dress rehearsal for the talent show will be held April 3 with the big show on the following day, Friday, April 4. Assistant Superintendent Jill Proulx addressed the changes to functionality that parents and students can expect to see in Spring report cards. The previous set of report cards were issued electronically but the versions were not printer-friendly. This issue should now be fixed. Additionally, Proulx mentioned that while it may appear at first glance that the report cards contain very little information, there will be interactive links that will take parents and students to more information. The town of Plympton is pursuing a Green Communities grant application which would help find clean energy solutions while reducing costs. Of importance to the school committee was the timing for the Green Communities projects as the Dennett School will host much of the district’s summer programming as well as potential demolition and rebuilding work on the playground. The committee also agreed on the importance of receiving confirmation that the projects would be funded at no cost to the Dennett school. Fraser mentioned his work with Massachusetts legislators including Representative Josh Cutler (D-Duxbury) in advocating for an increase in the Chapter 70 minimum per pupil increment from $20 to $100. Representative Kathleen LaNatra and Senator Michael Brady have also signed on in favor of the proposed increase. Chapter 70 is Massachusetts’ program to ensure adequate funding for all of the Commonwealth’s public K-12 school districts. Once a foundation budget has been established for each school district, each community’s property values and residents’ incomes are then analyzed to determine what percentage of the foundation budget should come from local property taxes. The remaining portion of the foundation budget is funded through Chapter 70 state aid. An increase in the minimum per pupil spending would provide a boost to the Silver Lake district. The committee unanimously voted at Monday’s meeting to approve the 2019-2020 operating budget. Superintendent Joy Blackwood noted that the Dennett budget had been reduced by $10,000 from the original version 1 of the budget by decreasing the cost of the math textbook adoption and reducing utilities. Two areas of increase in the budget were special education and continuing education for teachers. The committee has yet to hear back from the finance committee regarding the proposed budget. 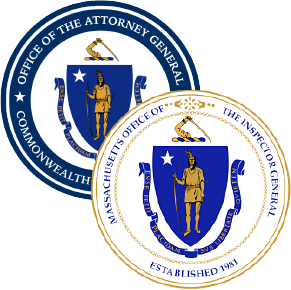 Robert Tinkham, the current Plympton Health Agent, and another local public official, Ray Pickles, the Marion Town Clerk, have been indicted on larceny charges after a joint investigation by the Massachusetts Attorney General’s Office and the Massachusetts Office of the Inspector General into years-long mismanagement at the Carver, Marion and Wareham Regional Refuse Disposal District, according to state officials. Tinkham, 57, of Carver, who was the former district board chairman, and Pickles, 85, of Marion, who was the former district executive director were indicted by a statewide grand jury Monday, March 18, 2019, Attorney General Maura Healey and Inspector General Glenn Cunha announced in statements this week. Tinkham along with Pickles allegedly stole more than $675,000 in district funds. Of that amount, Tinkham is alleged to have stolen $65,000 and Pickles allegedly stole $610,000, according to the statements. The investigation revealed that Tinkham allegedly received $65,000 in payments from the district for inspection services he did not perform while he was the chairman of the district board. Pickles also allegedly opened district accounts that only he knew existed at two other banks. Investigators allege he deposited checks intended for the district into these accounts, withdrew cash for personal use and made payments on his personal credit cards. Investigators further allege that Pickles billed the district for services he did not perform and used district funds to pay for personal expenses. Pickles was elected Marion Town Clerk through 2020, and the Town of Marion has no process for recalling elected officials, having defeated a warrant item to add such a process at a previous town meeting, according to a statement from Marion Town Administrator Paul Dawson. Tinkham was charged with one count of larceny over $250 and one count of presentation of false claims while Pickles was charged with six counts of larceny over $250. The defendants will be arraigned at a later date in Plymouth County Superior Court. The charges are the result of an investigation by the Massachusetts Office of the Inspector General, the Massachusetts Attorney General’s Office and the Marion Police Department, in cooperation with the towns of Carver, Marion and Wareham. Neither of the accused currently works for the district. The defendants are presumed innocent until proven guilty. This case is being prosecuted by Special Assistant Attorneys General John Brooks and Ashlee Logan, of the Inspector General’s Investigations Division, with assistance from Chief Trial Counsel James O’Brien of the AG’s Criminal Bureau. Lead Investigator Logan Davis and Analyst/Investigator Will Bradford from the Inspector General’s Office investigated the case. The district is suing Tinkham, Pickles and his wife Diane Bondi-Pickles in Plymouth Superior Court in a civil suit making similar allegations. Hanover police arrested Michael Davis, 47, of 27 Beaver Dam Road, Plymouth, on Monday, March 4. He was arraigned in Hingham District Court the next day on charges of breaking and entering a building in the nighttime for a felony, destruction of property, and possession of a burglarious instrument, according to court records. The alleged copper thief was apprehended as part of a multidepartment investigation and surveillance operation that included Sergeant Brian Cranshaw, of the Plympton Police Department, as part of the Old Colony Police Anti-Crime Unit, police reports said. Davis is suspected in multiple home break-ins across the South Shore. He allegedly breaks into homes that are listed for sale, and after ensuring they are empty, goes into the basement and cuts out all the copper piping. Investigators applied for and were granted a warrant for a GPS-tracking device for Davis’s car, after growing suspicious of him, a source familiar with the investigation said. This led police to the Hanover location where they found Davis inside a Broadway Street home listed for sale in the act of cutting copper pipes in the basement, where they confronted him. Davis ran off into the woods, but police were able to track him down and arrest him. He pleaded not guilty in front of Judge Heather Bradley and posted $250 cash bail. He must stay away from the alleged victim and out of the Town of Hanover as part of his pre-trial probation conditions. Weymouth-based attorney Christopher Affsa was appointed by the court to represent Davis. He is scheduled to be back in Hingham District Court May 1, 2019, for a pre-trial hearing. WAREHAM — Matthew Will, 37, of Halifax, now faces six larceny-related cases between Plymouth County district courts representing some 26 open charges, prosecutors said in Wareham District Court on a snowy Monday, March 4. He appeared for an arraignment on the new, similar case alleged in Middleboro, this time for one charge of larceny over $1,200 by false pretense, as well as for three pre-trial conferences on outstanding cases. Will is the owner of Five Star Discount Roofing, of Halifax, and stands accused of victimizing now, at minimum, 24 area households in at least three communities across the county by beginning construction work and not completing it, or not doing work at all, after accepting deposits. The newest case, police records say, involves a 77-year-old Middleboro woman, who hired Will to fix her roof in September 2018. Will asked her for $4,000 upfront for supplies for the job, and the woman wrote him a check for that amount. On Feb. 7, 2019, the work had not yet begun and the homeowner went to police. Police then applied for a criminal complaint against Will. Both Jack Atwood, Will’s Plymouth-based defense attorney, and Will were late for the already delayed 11 a.m. court opening, which started late due to the early-morning snowstorm. Atwood said he was driving from another court. He successfully filed a motion to withdraw as counsel because Will was not adequately assisting in the preparation of his defense, he said. “I don’t represent him on the new charge,” said Atwood, of Will. Arguing against the $1,000 cash bail for his new client’s release, as requested by the commonwealth’s Assistant District Attorney Jonathan Schulman at the arraignment, Russell stated that Will had not been convicted of any charges, up until recently had no criminal complaints other than an “old fish and wildlife charge,” had been a reputable contractor up until his “business went south” and has four children. Mooney released Will on personal recognizance on the new case, citing the fact that he was already being held on bail in other cases. The alleged victims now claim they have lost a combined $157,197.34, with individual losses ranging from $695 to $15,569. Most of these victims are over age 55, and many are quite elderly, according to police reports. The alleged victim who lost the most money is 78-years-old. Plympton selectmen Monday night were surprised by the request of Highway Superintendent Scott Ripley to declare a snow and ice emergency as he has used up his snow removal funds for the season. 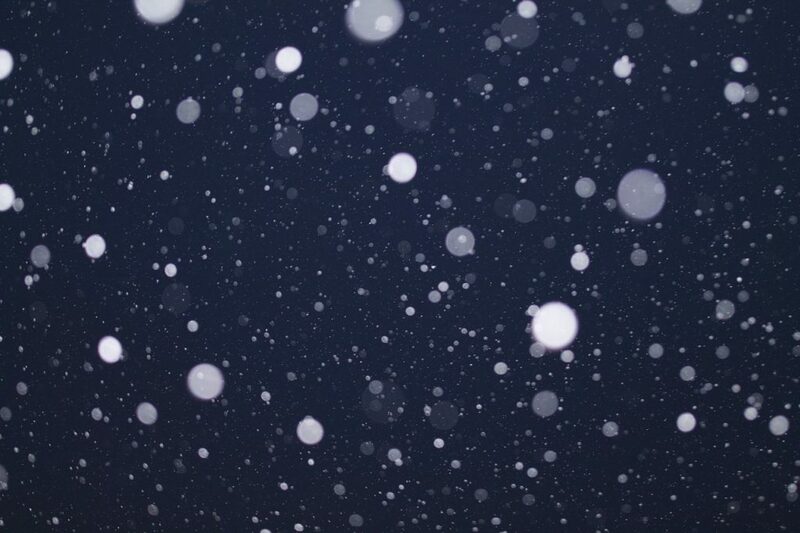 Having been a winter with the least snow in recent memory, according to Boston weather people, selectmen said they would either call him in to explain, or perhaps just have a member of the board meet with him and discuss how the funds were spent. In all fairness, Ripley began his position of Highway Superintendent in August, 2018, after the budgets were set by Town Meeting vote ion May of 2018. Town Administrator Elizabeth Dennehy presented the marijuana by-law produced by Ann Sobolewski with the Planning Board for selectmen’s approval. The approved by-law will be returned to the Planning Board so a hearing may be scheduled in preparation for the Annual Town Meeting in May. Selectman Christine Joy told the board that Plympton needs to do a much better job in its recycling, as does the rest of the country, and the effects are being felt throughout our economy. China no longer buys our mixed paper for recycling because of the contaminants we allow, an average of 25%, forcing the United States to look elsewhere to sell its mixed paper. What in 2017 brought $90 per ton in trade with China, in 2019 brings only $4 a ton from other markets like India. “I don’t know that the country will ever get China back,” Joy said. What items are the worst offenders? Think long, stringy things that tangle up the processor: garden hoses, plastic one-use grocery bags, plastic wrap. Don’t put recyclables in plastic bags. The attendant won’t open the bag; it just goes into the trash. Clothing can’t be processed with recyclables; in Plympton, it goes in the charity bins near the bottle and can redemption trailer. The presentation she attended also cited help Massachusetts is giving in the way of grants for educating residents about what is recyclable and what is trash, and also grants for building recycling facilities, to help communities get serious about recycling. Selectmen unanimously approved the application of Upinto2, Inc., the corporate name of the motorcycle riding school on County Road. Upinto2, Inc. was granted a Class II motor vehicle sales license to sell motorcycles, primarily to their students. Selectmen stipulated that no motorcycles were to be displayed outdoors for sale and no more than 40 motorcycles, 10 of which would be for sale, the rest for students to ride in classes, would be on the premises at a time. • executed a contract for Air Vacuum Corporation to deal with the exhaust fumes of vehicles at the Fire Station. • voted to open the warrants for the Special Town Meeting and the Annual Town Meeting, both to be held May 15. • reviewed the process of compiling the Annual Town Report, making sure that boards and committees follow the instructions to submit their reports to the town before the March 21 deadline. The next meeting will take place March 11, at 6 p.m. unless otherwise noted. 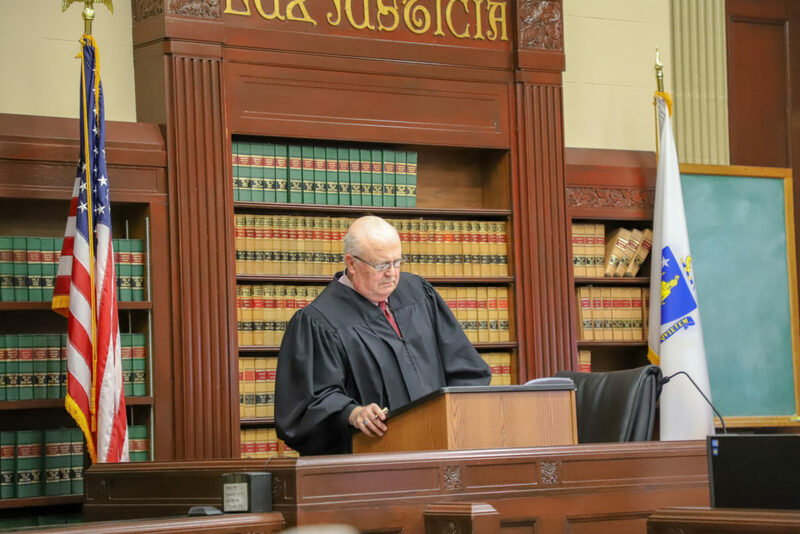 Superior Court Judge Robert Cosgrove hears arguments to dismiss several charges in the lawsuit filed by the Carver, Marion and Wareham Regional Refuse Disposal District against Plympton Health Agent Robert Tinkham, Ray Pickles and Diane Bondi-Pickles. Robert Tinkham, of Carver, the Plympton Health Inspector, asked a judge to drop several charges against him in a civil suit alleging he defrauded the Carver, Marion and Wareham Regional Refuse Disposal District, where he was a member of the committee overseeing the district (and at times chairman of that committee) in his capacity as the Carver Health Agent. He, along with two alleged co-conspirators, Ray Pickles, once the district’s Executive Director, and his wife Diane Bondi-Pickles, a real estate agent, are accused of stealing in excess of $838,458.22 from the district. At a hearing Jan. 14, Superior Court Judge Robert Cosgrove took the matter under advisement. On Feb. 7, Cosgrove partially allowed and partially denied the motion to dismiss the charges, and while he dropped one of the charges, six charges still stand. In an 18-page written ruling, Cosgrove outlined his rationale charge-by-charge. The complaint against the three defendants originally contained nine charges. Two of the charges were plead in the original complaint only to “reach-and-apply” defendants, who have since been dismissed from the action, and therefore those two charges are no longer applicable. Tinkham argued that count six should be dismissed for three reasons: failure to allege any contract subject to the laws, failure to allege that he was a “procurement officer” as defined by the law and that there is no private right to sue under the act. The lawsuit now charges Tinkham with six causes of action: conversion and civil theft; breach of fiduciary duty; fraud; money had and received; civil conspiracy; and violations of M.G.L. c. 93A, the consumer protection law. The lawsuit alleges Tinkham received monetary payments from the district between 1995 and 2018, but other waste district committee members did not receive compensation for their services. He did not have a contract or employment agreement with the district, and no taxes were withheld on the payments, according to the original lawsuit, which was later amended by the district. Court records say he billed the district for landfill inspections while working for the Town of Carver. Carver’s job description for the health agent includes inspecting the Carver landfill, according to public records. In 2007, Carver officials reaffirmed this aspect of the job description. But, the Carver landfill, leased by the district, is inspected by a professional engineer. Tinkham is not an engineer, according to his resumé, and he kept no records of his inspections for Carver, if they indeed occurred, the lawsuit alleges. The total amount paid to him for inspections by the district was $88,990. In the lawsuit, the district points to 13 representative examples from 2004 and 2005 alone of Tinkham collecting payments from the district while being paid a salary from the Town of Carver. Tinkham also stands accused of providing no goods or services in connection with money he was paid for the district’s “Grant/Recycling” services, between 2012 and 2018, totaling $88,100. He allegedly submitted false documentation for payment for that work. Tinkham also stands accused of receiving payments not supported by any documentation at all. “In total, there are 82 payments totaling $86,703.82 for which payment was made but the District has no invoice or proof of any services rendered,” say court records. The alleged fraud was discovered when Pickles, in 2017, without the authorization of the committee, sought payment of assessments from the district towns for the first time since 2015. When Carver and Wareham refused to pay, claiming a lack of documentation, Pickles used district counsel, without authorization, to sue for breach of contract in Wareham District Court. That suit was voluntarily dismissed. Pickles was terminated Jan. 29, 2018. The district was created as a regional refuse disposal district in 1973 by a special act of the General Court. It is an independent body-politic, based in Marion, funded by user-fees, assessments to the member towns and agreements with third-parties. According to files obtained by the Express, the state Office of the Inspector General is investigating the alleged misconduct as well, in addition to the lawsuit against Tinkham, Pickles and Bondi-Pickles. HANSON — Maura Murray, then 21, a native of Hanson, vanished after she crashed her 1996 Saturn into a snowbank along a curve on Wild Ammonoosuc Road (Route 112) in Woodsville, New Hampshire, a village of Haverhill, 15 years ago. The UMass Amherst nursing student’s mysterious disappearance on Feb. 9, 2004 has sparked worldwide attention in the press, on the Internet and on social media over the course of the last decade and a half. 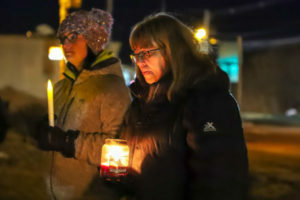 Family, friends and supporters of Maura Murray marked the somber anniversary Saturday in New Hampshire and here in Hanson by lighting candles in hopes that she will be found. Her father, Fred Murray, 76, had shared with the public new details of an investigation he has conducted into her disappearance with the hope that the public attention will put pressure on New Hampshire authorities to further look into the matter. Investigators, meanwhile, say the investigation is still active. Fred Murray, who spoke to the Express Monday, Feb. 11, says that he is certain he has found a burial site in a house “astonishingly close” to the site of the accident. According to him, locals first tipped him off about suspicious activity at the house in the first year after his daughter’s disappearance, including rumors of new concrete being poured in the basement shortly after the accident, he says. Although he told the Expressthat he is not positive that it’s his daughter who is buried in the house, he strongly believes that there are human remains in the house and that they are likely those of his daughter. “I only need to be right once,” he pointed out. The house, which he says police never searched, a point which officials don’t advertise unless pressed in statements, has come under new ownership since Maura Murray’s disappearance, and the new owners have been receptive to Fred Murray’s investigation. He says he is willing to pay to dig up their basement, although he’d rather New Hampshire authorities do it. The New Hampshire Attorney’s General office said in a statement that they “searched the area with dogs at the time,” but never searched inside the house in question. In November and December 2018, Fred Murray brought in two trained, accredited cadaver detecting dogs to the house, each one on separate occasions. They alerted, he says, by lying down in the same spot in the basement of the house. He says that video of the dogs alerting exists, and is available widely online from local television media outlets. Later, ground-penetrating radar was used and indicated strong findings of an abnormality in the same spot in the concrete, he said. Much of Fred Murray’s investigation has been paid for by donations and through pro-bono work of those who support him, he says. “It’s astounding that this [basement] wasn’t looked at before. I told the police about this in the first year … the State Police did an inadequate job when my daughter first went missing,” he added, adamantly. Fred Murray said he has found the local police to have been less-than-helpful, and as for federal law enforcement, “The FBI has been dodging it [the case] for 15 years … they’re useless,” he said of the Boston office of the FBI. “Because of the institutional intransigence of the New Hampshire State Police the case is still alive 15 years later,” he said. A representative for the New Hampshire Department of Safety, of which the New Hampshire State Police are a division, refused to comment because of the active nature of the investigation, but did refer the Express to the Office of the New Hampshire Attorney General. “The case is still open and active. We do receive tips and information periodically, as well as generate new information from investigative efforts,” said Jeffrey Streizin, Associate Attorney General and Director of the Division of Public Protection with the New Hampshire Attorney’s General office in an emailed statement. Exactly where Maura Murray was headed, and why, has remained a mystery over the years. Moments after the crash, a good Samaritan stopped to assist her, but she waved him off and told him not to call the police, according to original police reports from 2004. The passerby called local police anyway, although he did drive off. A Haverhill police cruiser arrived within minutes, but the Saturn was locked, and Maura Murray was gone. According to a four-part series reported by Maribeth Conway in this paper’s predecessor, the Hanson Express in 2007, Fred Murray had dinner with his daughter in Amherst two days before her disappearance. She caused damage to her father’s car that night in a minor accident near UMass in Hadley, Massachusetts, and later friends reported she had been drinking that night, although no charges were filed in that incident. The following day, she performed Internet searches for driving directions to Vermont and the Berkshires. She also called for a condominium rental reservation in Bartlett, New Hampshire, which she did not end up reserving. Her family often vacationed in Bartlett, a town in the White Mountains near the Attitash ski resort. Her belongings were neatly packed up in boxes in her UMass dorm room before she left, according to reports, leading to speculation that she may have been considering leaving school permanently. But she had good grades, and her college textbooks were found in her car by investigators after the accident. Maura Murray withdrew $280 from her bank account, leaving the account almost empty, and emailed professors and her boss at a local art gallery that she would be away from school because she was needed in Hanson due to a death in the family. Relatives later confirmed there was no death in the family. No one is sure exactly why the college student made up the story. A friend later suggested that Maura Murray may have been under a lot of pressure and wanted to get away to think about something important. She grabbed some toiletries, a favorite stuffed animal — a monkey given to her by her father– and a necklace her boyfriend had given her. She then departed. Police say she next stopped at a liquor store, bought about $40 worth of alcohol — which police reports say some of which was found in plain sight in her car after the crash– and never returned to Massachusetts.